5.56 ammo for sale 1000 rounds at $0.23 per round. 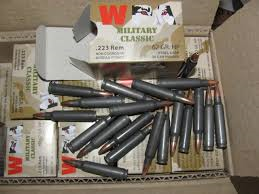 This is a 500 round case of 5.56 Nato/223 ammunition from the world famous Wolf WPA distributor. Sale price for a 500 round case is $117.00 or $234.00 for 1,000 rounds. This is steel cased ammo from a select group of manufacturers in Russia and the Ukraine. It is top notch ammo made with strict manufacturing controls. The steel cases are “soft” steel and will not harm rifle barrels or chambers. The steel cases are coated with either polymer or lacquer to prevent corrosion and facilitate feeding and extraction. 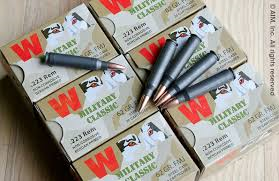 WPA Military Classic 5.56/223 ammo features 55 grain HP bullets, non-corrosive berdan primers and steel cases. 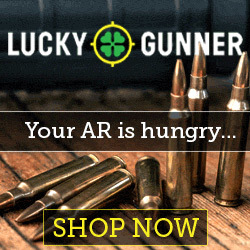 It is reliable and affordable ammunition. If you shoot often and do not reload then Wolf WPA 5.56 ammo is the best choice for target practice or SHTF type scenarios. I have fired 1,000’s of rounds of Wolf WPA Military Classic 7.62×39 in my AK-47 without a single misfire. I’ve also fired many boxes of the same make 5.56 ammo through a Stag Arms 2T AR-15 rifle without a hitch. It’s accurate, reliable and clean burning. You may hear someone say that Wolf ammo is dirty but it certainly is not.